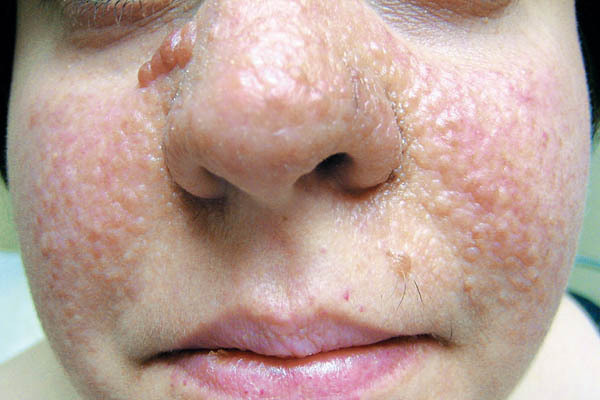 A rash of reddish spots or bumps, which appear on the nose and cheeks in a butterfly distribution. They consists of blood vessels and fibrous tissue. This socially embarrassing rash starts to appear during childhood . It is the skin abnormality of the disease “Tuberous sclerosis” which is a rare multi-system genetic disease that causes non-malignant tumors to grow in the brain and on other vital organs such as the kidneys, heart, eyes, lungs, and skin.